Appeared in 57 games (32 starts) for the Toronto Raptors and averaged 5.0 points (.475 FG%, .574 FT%), 2.2 rebounds, 1.2 assists and 16.2 minutes…missed a total of seven games due to injury, 14 games as a DNP-CD, two games as a healthy scratch on the inactive list and two games due to rest…sat out Dec. 2 at Atlanta due to a sore left Achilles…missed five games with a sprained left ankle (Dec. 22 and Feb. 2-10)…sat out one game (Mar. 18 vs. Boston) due to plantar fasciitis in his left foot…was fourth on the team in both assists and blocks…topped the team in rebounds and assists one time each and was Toronto’s leading scorer off the bench twice…scored in double figures seven times…Season Highs: 14 points (vs. Sacramento, Dec. 20), nine rebounds (at Washington, Jan. 8), five assists (at Miami, Dec. 18), four blocks (vs. New York, Jan. 28), two steals (seven times) and 32:29 minutes (vs. Sacramento, Dec. 20). Appeared in 70 games (17 starts) for the Raptors and averaged 7.9 points (.589 FG%, .657 FT%), 3.7 rebounds, 1.4 assists, 1.00 blocks and 19.6 minutes…missed a total of seven games due to injury and was a DNP-CD on five occasions…sat out three games (Nov. 19-22) with a sprained right ankle and four games (Jan. 30-Feb. 4) with a strained right hamstring…set single-season career highs in games played, field goals made and field goal percentage…finished second on the team in blocks…topped the Raptors in scoring twice, in rebounds on five occasions and in assists once…was Toronto’s leading scorer off the bench eight times…scored in double figures a career-high tying 24 times, including a pair of 20-point games…grabbed double-figure rebounds a career-high tying three times and posted a pair of double-doubles…blocked at least one shot in a career-high 10 consecutive games from Feb. 11-Mar. 6…scored a career-high 27 points at Houston on Feb. 21…Season Highs: 27 points (at Houston, Feb. 21), 11 rebounds (at Portland, Dec. 30), five assists (vs. Oklahoma City, Nov. 4), four steals (four times), four blocks (three times) and 36:08 minutes (vs. Boston, Jan. 10). Split the season between the Memphis Grizzlies of the NBA and the Rio Grande Valley Vipers of the NBA D-League…appeared in 52 games (four starts) for the Grizzlies and averaged 7.4 points (.464 FG%, .844 FT%), 3.2 rebounds, 2.1 assists, 1.10 blocks and 18.4 minutes…did not officially miss any games due to injury and was a DNP-CD on seven occasions, one of which he dressed despite a sprained right ankle (Mar. 3 at Washington)…set a single-season career high in free throw percentage…led the NBA in blocks on opponents’ three-point field goal attempts (16)…ranked second on the team in blocks per game and third in total blocks…topped the team in scoring three times, in blocks 19 times, in steals nine times, in assists on six occasions and in rebounds and minutes once each…scored in double figures 18 times, including one 20-point performance…grabbed double-figure rebounds once and posted one double-double…recorded multiple blocked shots in a career-high eight consecutive games from Jan. 7-24…handed out a career-high eight assists vs. Houston on Jan. 25…matched his career high in blocks with six at Milwaukee on Jan. 15…started all 10 games in which he appeared for the Vipers and averaged 18.5 points (.496 FG%, .773 FT%), 9.1 rebounds, 4.8 assists, 3.40 blocks, 1.90 steals and 29.9 minutes…at the time of his call-up, he was the only D-League player to rank in the Top 15 in scoring (14th), rebounding (12th) and assists (14th) while also placing third in blocks and tied for seventh in steals per game…scored in double figures eight times, including six games with at least 20 points…grabbed double-figure rebounds seven times and posted seven double-doubles and five 20-10 games…NBA Season Highs: 20 points (at San Antonio, Apr. 6), 10 rebounds (vs. Chicago, Dec. 30), eight assists (vs. Houston, Jan. 25), six blocks (at Milwaukee, Jan. 15), four steals (vs. Houston, Jan. 25) and 33:13 minutes (vs. Utah, Dec. 23). 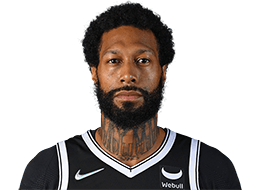 Appeared in 54 games (11 starts) for the Sacramento Kings and averaged 5.1 points (.413 FG%, .597 FT%), 2.7 rebounds, 1.1 assists, 0.93 blocks and 16.3 minutes…missed one game due to injury (Feb. 2 at New York with a sinus infection), 19 games as a DNP-CD and eight games for personal reasons…led the team in blocks per game and ranked third in total blocks…topped the Kings in scoring once and in assists twice…scored in double figures 10 times…hit a game-winning three-point field goal at the buzzer on Dec. 26 vs. New York to give the Kings a 106-105 victory…Season Highs: 17 points (vs. New York, Dec. 28), nine rebounds (at Charlotte, Jan. 19), five assists (vs. L.A. Lakers, Nov. 21), five blocks (at Brooklyn, Jan. 5), three steals (twice) and 32:36 minutes (vs. Portland, Nov. 13). Saw action in 62 games (40 starts) for the Toronto Raptors in the lockout-shortened season and averaged 9.1 points (.450 FG%, .704 FT%), 4.7 rebounds, 2.0 assists, 1.35 blocks, 1.15 steals and 25.2 minutes…missed two games due to injury and two games as a DNP-CD…sat out one game (Jan. 16 at Atlanta) with a sprained right ankle and one game (Mar. 28 vs. Denver) due to an upper respiratory infection…set single-season career highs in points, scoring average, starts, minutes, field goals attempted, free throws made and attempted, offensive, defensive and total rebounds, assists, steals and blocks…became the first Raptor to lead the team in both steals and blocks in the same season…ranked second on the team in field goals made and attempted, third in points, defensive and total rebounds, assists, free throws attempted and minutes and tied for third in free throws made…topped the Raptors in points, rebounds and assists five times each…scored in double figures a career-high 24 times, including a career-high three 20-point efforts…scored in double figures a career-high four consecutive games from Mar. 2-7…grabbed double-figure rebounds a career-high three times and posted a career-high three double-doubles…posted single-season career highs in multi-steal games (19) and multi-block games (25)…started a career-high 36 consecutive games from Jan. 18-Mar. 26…grabbed a career-high 13 rebounds at Milwaukee on Apr. 23…had a career-high six steals vs. Indiana on Dec. 28…blocked a career-high six shots at Utah on Jan. 25…Season Highs: 23 points (vs. Portland, Jan. 20), 13 rebounds (at Milwaukee, Apr. 23), seven assists (vs. Orlando, Mar. 5), six steals (vs. Indiana, Dec. 28), six blocks (at Utah, Jan. 25) and 47:04 minutes (at Chicago, Mar. 24). Split the season between the Chicago Bulls and Toronto Raptors of the NBA and the Iowa Energy of the NBA D-League…appeared in 38 NBA games (25 starts) and averaged 7.1 points (.456 FG%, .662 FT%), 3.7 rebounds, 2.3 assists, 0.97 blocks and 21.6 minutes…did not miss any games due to injury but was a DNP-CD on 34 occasions (all with Chicago) and missed seven games (Jan. 28-Feb. 12) while on a D-League assignment to Iowa…scored in double figures 11 times and grabbed double-figure rebounds once…came off the bench in all 13 games in which he appeared with the Bulls and averaged 3.2 points (.415 FG%, .462 FT%), 1.8 rebounds, 1.1 assists and 9.5 minutes…started all 25 games in which he appeared for the Raptors and averaged 9.2 points (.464 FG%, .707 FT%), 4.7 rebounds, 3.0 assists, 1.12 blocks, 1.00 steals and 28.0 minutes…topped the Raptors in rebounds and assists once each…started all eight games in which he appeared with the Energy and averaged 19.3 points (.535 FG%, .918 FT%), 8.9 rebounds, 4.3 assists, 2.50 blocks, 1.00 steals and 32.1 minutes…scored in double figures in all eight games, including three games with at least 20 points and one 30-point performance…grabbed double-figure rebounds four times and posted four double-doubles…NBA Season Highs: 18 points (vs. New Jersey, Apr. 10), 10 rebounds (vs. Milwaukee, Mar. 30), seven assists (vs. Dallas, Feb. 27), three steals (twice), three blocks (three times) and 41:51 minutes (vs. Miami, Apr. 13). Appeared in 65 games (11 starts) for the Bulls and averaged 3.9 points (.452 FG%, .729 FT%), 2.0 rebounds and 11.6 minutes…missed two games due to injury and was a DNP-CD on 15 occasions…sat out a pair of games (Mar. 27 and Apr. 3) with a right foot strain…ranked among the NBA rookie leaders in blocks per game (4th)…led the Bulls in scoring twice…topped the Bulls in scoring twice…scored in double figures six times, including one 20-point performance…hit a career-high 17 straight free throw attempts from Nov. 26-Jan. 9…made his NBA debut on Oct. 30 at Boston and totaled four points and three rebounds in 11:28 of action…made his first career start on Mar. 1 vs. Atlanta and tallied nine points, two rebounds, two blocks, one assist and one steal in 23:42 of action…Season Highs: 20 points (at Miami, Mar. 12), eight rebounds (vs. Cleveland, Mar. 19), four assists (at Orlando, Mar. 11), four blocks (at Memphis, Mar. 16), three steals (at Orlando, Mar. 11) and 42:45 minutes (at Miami, Mar. 12). 2018: Started all five games in Miami’s Opening Round series vs. Philadelphia and averaged 12.4 points (.548 FG%, .643 FT%), 6.0 rebounds, 4.8 assists, 1.20 steals, 1.20 blocks and 32.1 minutes…ranked among the NBA postseason leaders in three-point field goal percentage (5th), field goal percentage (12th), blocks per game (tied-12th), assists per turnover (14th), assists per game (17th), rebounds per game (tied-33rd) and steals per game (tied-33rd)…led the HEAT in minutes, field goal percentage, defensive rebounds and assists and tied for the team lead in blocks…topped the team in blocks twice and in minutes, rebounds and steals once each…scored in double figures four times, including a postseason career-high 18 points in Miami’s Game 2 win on Apr. 16…shot 7-7 from the floor in Game 2 which is one shy of the HEAT postseason record for most field goals made in a game without a miss…set postseason career high in both minutes (36:34) and steals (3) in Game 2…grabbed a postseason career-high eight rebounds in Game 4 on Apr. 21…2016: Came off the bench in all 10 games in which he appeared for the Raptors and averaged 3.0 points (.480 FG%, .667 FT%), 1.5 rebounds and 9.8 minutes…did not miss any games due to injury but was a DNP-CD on 10 occasions…scored in double figures twice…appeared in just one game in the Opening Round series vs. Indiana and totaled two points and one assist in 3:19 of action…saw action in three games of the Eastern Conference Semifinal series vs. Miami and was scoreless with two rebounds and a steal in 12:32 of action…appeared in all six games in the Eastern Conference Finals vs. Cleveland and averaged 4.7 points (.500 FG%, .000 FT%), 2.2 rebounds and 13.6 minutes…2015: Came off the bench in both games in which he appeared for Toronto in its Opening Round series vs. Washington and averaged 2.0 points (.333 FG%, .000 FT%), 1.0 rebounds and 6.0 minutes…did not miss any games due to injury but was a DNP-CD twice in the four-game series…2014: Came off the bench in all three games in which he appeared for Memphis in its Opening Round series vs. Oklahoma City and averaged 6.3 points (.333 FG%, .700 FT%), 2.0 rebounds and 9.3 minutes…did not miss any games to injury but was a DNP-CD on four occasions…scored in double figures once…2010: Came off the bench in all four games in which he appeared for Chicago in its Opening Round series vs. Cleveland and was scoreless with one rebound and one assist in 19:55 of action…did not miss any games due to injury but was a DNP-CD once…made his NBA postseason debut in Game 1 at Cleveland on Apr. 17. Played two seasons at Wake Forest before becoming an early entry candidate for the 2009 NBA Draft…appeared in 61 games (59 starts) for the Demon Deacons and averaged 14.8 points, 8.3 rebounds, 1.6 assists, 1.44 blocks, 1.39 steals and 29.9 minutes…was a two-time Third Team All-ACC selection…was a Freshman All-American and the runner-up for the ACC Rookie of the Year…finished his career with 903 points and 508 rebounds…led Wake Forest in rebounds in each of his two seasons…started all 31 games for the Deacon Demons as a sophomore in 2008-09 and averaged 15.0 points (.542 FG%, .697 FT%), 8.5 rebounds, 2.0 assists, 1.55 blocks, 1.42 steals and 30.5 minutes…led the team in field goal percentage, rebounds and blocks as a sophomore and ranked second in scoring and steals…had career highs of 28 points and 18 rebounds vs. North Carolina State on Feb. 26, 2009…hit a game-winning lay-up with 0.8 seconds left to beat No. 1 ranked Duke, 70-68, on Jan. 28, 2009…led Wake Forest with 22 points, eight rebounds and four blocks vs. Cleveland State in the Opening Round of the 2009 NCAA Tournament at Miami…appeared in all 30 games (28 starts) for Wake as a freshman in 2007-08 and averaged 14.6 points (.487 FG%, .689 FT%), 8.1 rebounds, 1.37 steals, 1.33 blocks, 1.2 assists and 29.2 minutes…was just the third player in school history to earn All-ACC honors as a freshman joining Rodney Rogers and Chris Paul…was named to the ACC All-Freshman team after leading the Deacon Demons in both points and rebounds, becoming the first freshman to accomplish the feat since Rodney Rogers in 1991…was the first Deacon Demon freshman in the ACC era (since 1953-54) to average at least 14 points and eight rebounds per game…his 8.1 rebounds per game average was the 13th best by a freshman in ACC history…scored 24 points and grabbed a season-best 16 rebounds in Wake’s upset of second-ranked Duke on Feb. 17, 2008. Full name is James Patrick Johnson…is the son of Willie and Vi Johnson…is the middle child of nine children (six brothers and two sisters)…married his wife Diana in October of 2017…has three sons (Harlem, Naymin and Golden Johnson)…his father is a seven-time world kickboxing champion and a former Marine and his mother is a five-time nationals winner as a competitor in the sport…his parents are both black belts and each of his eight siblings are black belts of varying degrees…he holds a second-degree black belt…fought in his first mixed martial arts bout at the age of 18 and was declared the winner after 97 seconds…has an undefeated record in seven MMA matches, having fought in Utah, Colorado and Las Vegas…has used martial arts to train and went 21-0 in kickboxing competition…when he’s done playing he would like to get involved in UFC…is the second person of Samoan heritage to play in the NBA, following Wally Rank who played for the L.A. Clippers in the 1980-81 season…enjoys playing golf in his free time…created a series of signature hats for New Era during the 2017-18 season…his favorite sport other than basketball is football and he’s a fan of the New York Giants…as a junior in high school he led Cheyenne East to the 2006 Class 4A state championship…wears size 14 sneakers.